Here is a great way to personalize furniture, frames, boxes or mirrors. If you have shells from a beach vacation, love the coast or have a beach house this project can really bring back wonderful memories as well as give you a custom piece you made yourself! And best of all, it is easy (well, relatively speaking). I love easy! 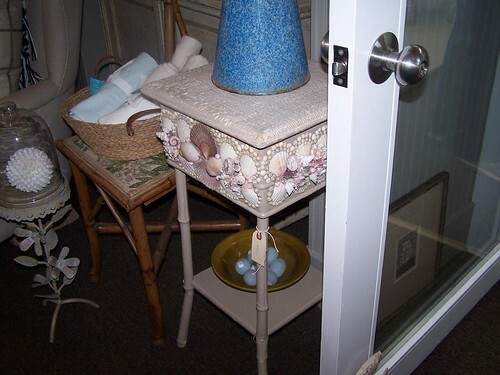 Find something you can attach the shells to–just walk around your house to find something that could use a little embellishment, or check out a thrift store or yard sale. Then just take a hot glue gun and attach some shells (you can buy these in bulk if you don’t have enough) and voila, you have a great piece! I must give credit to the place I found this neat little piece. Sesame and Lilies in Cannon Beach, Oregon. Their web address is www.sesameandlilies.com. While I am suggesting you could make something like this yourself, chances are it won’t be as beautifully crafted as the original! This store has lots of nifty things like this so unless you want to create something yourself, this store would be the place to find wonderful cottage and beachy stuff. Check them out!